I have reviewed quite a few books for TLC Book Tours and most of them have been fiction or memoir. When I saw that the National Geography Field Guide to the Birds of North America was a tour stopover, I was thrilled and intrigued. This fully revised and updated edition of the best-selling North American bird field guide is the most up-to-date guide on the market. Perfect for beginning to advanced birders, it is the only book organized to match the latest American Ornithologists’ Union taxonomy. 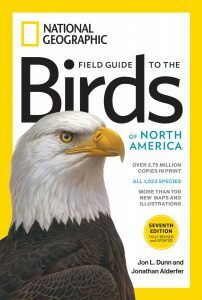 With more than 2.75 million copies in print, this perennial bestseller is the most frequently updated of all North American bird field guides. Filled with hand-painted illustrations from top nature artists, this latest edition is poised to become an instant must-have for every serious birder in the United States and Canada. The 7th edition includes 37 new species for a total of 1,023 species. Sixteen new pages allow for 250 fresh illustrations, 80 new maps, and 350 map revisions. With taxonomy updated to recent significant scientific rearrangement, the addition of standardized banding codes, and text completely vetted by birding experts, this new edition will stand at the top of the list of birding field guides for years to come. Although we don’t trek out to find illusive species, we are avid bird watchers from our patio. We look for a pair of cardinals to make their way to our platform feeder most every evening. We spy a lone blue jay who secretively makes his way to the feeders when no one seems to be watching. (For some reason, our jay is not aggressive and seems shy.) We watch the aggressive mocking birds chase off the chickadees. It’s an exciting time in the summer mornings when we spot a mallard pair noshing underneath the feeders. The arrival of the juncos marks the beginning of winter for us. The Field Guide to the Birds of North America boasts “All 1,023 species,” new maps and new illustrations. We’ve found some guidebooks’ illustrations to be pretty lack luster—it’s hard to distinguish colors and sizes. That’s not the case for this seventh edition. The illustrations are realistic and colorful. The book is categorized by species, families (following the the 2016 NACC guidelines), scientific names, and subspecies. It also describes behavior and voice for identification purposes. Individual maps mark the range. Because it covers all the species of North America, its girth might be a bit much to lug around in a back pack, but it’s perfectly fine for our patio bird watching. National Geography Field Guide to the Birds of North America would be a great gift for any naturalist or budding bird watcher on your holiday list. A pie was in order. 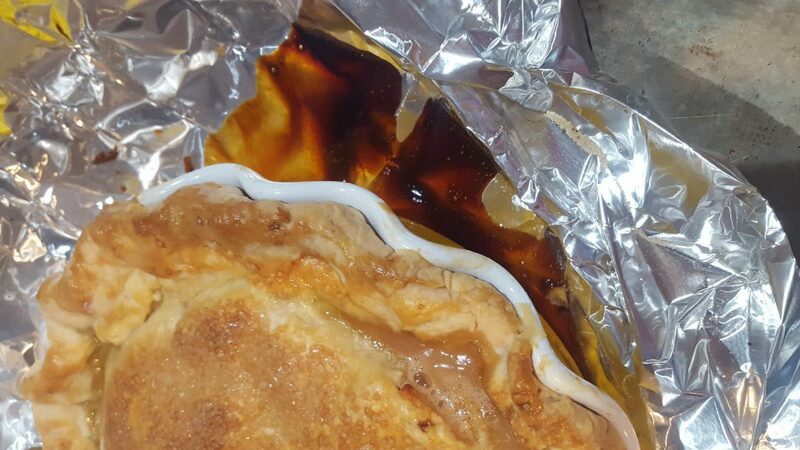 Just for fun, I did a Google search for “Four and Twenty Blackbird Pie.” This recipe popped up: Four & Twenty Blackbirds’ Truly Insane Apple Pie. How could I not make this recipe to celebrate a bird watching guide? 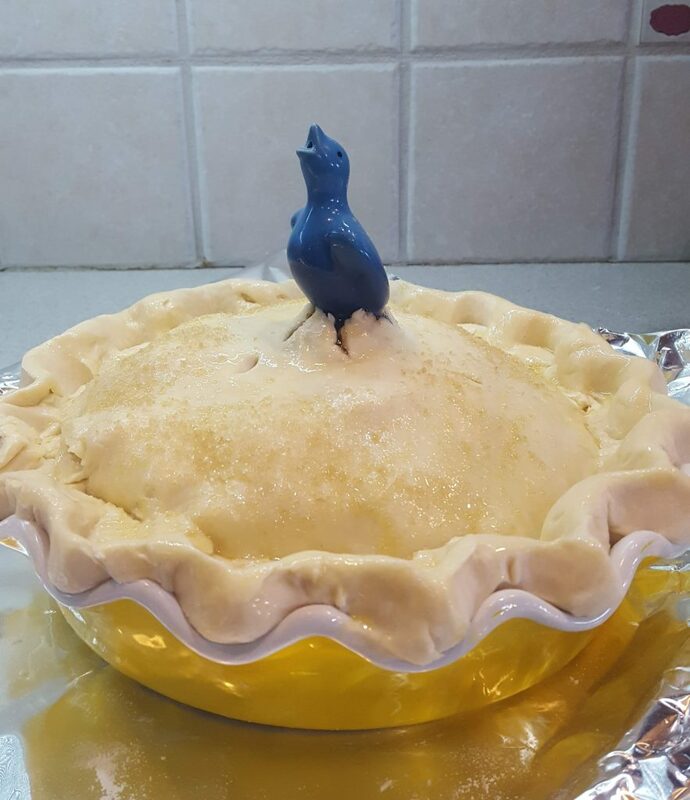 Besides, I wanted to use my new pie dish and a long-ago-bought bird shaped pie vent. National Geographic…Bird Watching…Mother Goose…Apple Pie….It all makes sense, right? I am not reprinting the recipe here but please check out this Insanely Terrific and Unbelievable Apple Pie. I hate to make pastry crust and truth be told, I usually don’t. This dough came together fairly quickly and easily in my food processor and came out flaky and buttery. The homemade caramel sauce is delicious. I would, however, dump all of the sauce on the pie and not the 1/2 to 3/4 cups that the recipe suggests. The combination of raw sugar, black pepper, cinnamon, bitters, all spice, and nutmeg is amazing. I used Granny Smith apples and their tartness complimented the rich caramel. You will also want to bake this on a foil-lined sheet pan. 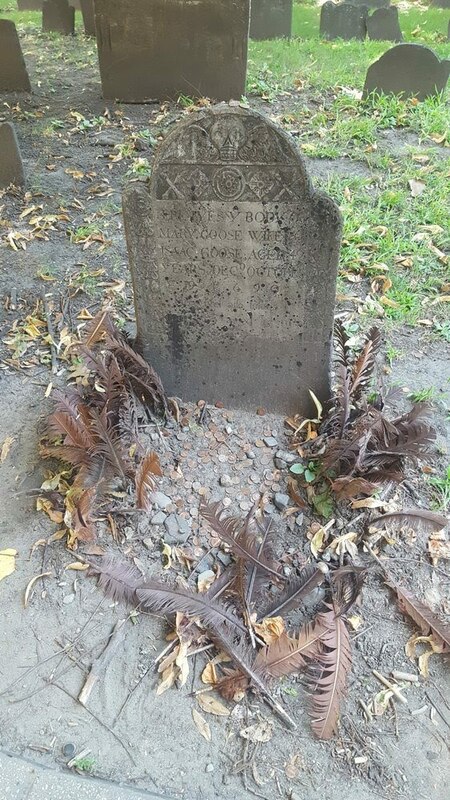 Aside: We did visit Mother Goose’s grave while we were in Boston this summer. Notice the feathers left in honor of this legendary figure. For all my TLC reviews, click here. 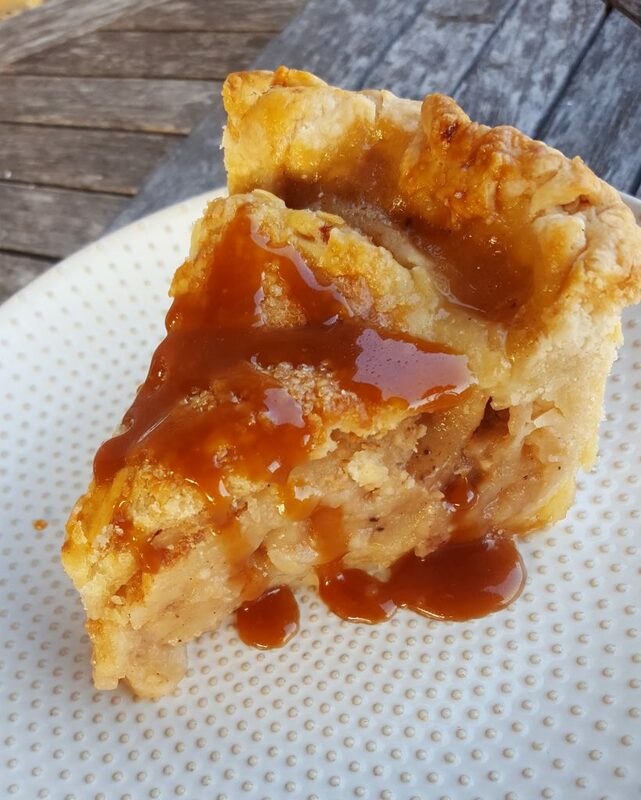 wow that slice of pie with homemade caramel is driving me nuts! Looks so darn good! 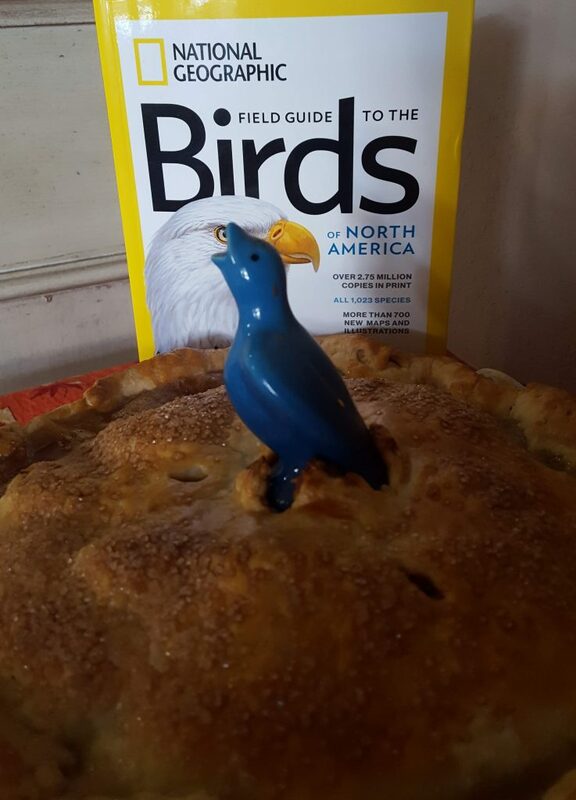 Some very creative thinking to come up with a pie from a bird book. 🙂 It looks fabulous! We have an old edition of that book in the house somewhere and used it a lot during out backpacking and camping days. It’s a great book. I’m not a bird watcher, but really like the idea. However, I’m most definitely a pie eater, and this one looks terrific. Really good stuff — thanks. Pies with live birds in them were sometimes served at randy medieval banquets. When I found this out, I was horrified to think of birds and food too close together. I love your one evidently well-behaved bird! The fact that this book has such vibrantly colored illustrations is a huge bonus in my opinion. I’m glad you found it interesting and helpful!